How to Protect Your Family from Mosquitoes? Do you know that mosquito is the most dangerous pest on the Earth? Yes, it is one of the smallest creatures, considered to be the deadliest in the world. If you think that mosquitoes are only about sucking blood from your skin then you certainly are unaware of their fatal effects on the human health. These not-so-friendly creatures can cause some deadly diseases like Malaria, Dengue, Chikungunya, encephalitis, yellow fever, etc. The time of winters is soon going to fade with the arrival of a warmer climate with blossoming flowers and a much active life. No doubt, summers are ideal to wear the most stylish robes and enjoy the cold desserts, but it is also the time that invites mosquitoes. You must know that mosquitoes are in their hyperactive state during the months of summer. As a result, you need to keep yourself and your family protected from the unhealthy effects of mosquitoes and diseases caused by them. Many homeowners prefer hiring professionals to get rid of the pest problems especially when it comes to the mosquitoes. But, you need to search for the trained and experienced pest control technicians for this. You can check online directories to search the best pest control services in Delhi/NCR and you will get the top results in your hand to choose the best pest control firm. Professional exterminators use high-quality pest control products and methods that are highly-effective in killing mosquitoes. In fact, they inspect your place to check the severity of the problem, so that they can develop the right pest management plan to kill mosquitoes and provide you safe and pest-free environment in and around your home. The best way to get rid of mosquitoes is to invest in mosquito control plan by hiring professional exterminators. There are many online websites where you can search for the best pest control company in Delhi, Gurgaon, Noida and Ghaziabad. They will provide you mosquito control services using high-quality pesticides and other pest control products. They also use different methods like chemical pest control, organic pest control, mechanical pest control, fogging, etc. Fogging is done for an immediate relief from mosquito infestation and exterminators use other chemicals or insecticides to remove mosquitoes completely from your residential or commercial spaces. So, hire the finest pest Control Company in Delhi to get rid of mosquitoes and prepare for the forthcoming spring season. But, if you think that the methods used by professional exterminators are not good for your health and you want to go for natural ways then, there are few things that you can do. Before proceeding to the natural remedies for mosquito control, we will discuss about the reasons that draws mosquitoes in your home. Researchers said that mosquitoes only live at dirty places so, homeowners must keep their houses or surroundings neat and clean. But, it is not possible for everyone to clear the entire junk from everywhere. Mosquitoes can easily find a way to enter your home. From an open door or window or even from the sinks holes, mosquitoes can find several ways to get into your home. Stagnant water is a big invitation for the mosquitoes to reproduce. People usually overlook the issue of still water and hence, face severe health issues. Therefore, it is essential to regularly check the rain spouts, or air-conditioning units, etc. One of the simplest remedies to get rid of mosquitoes is using coffee ground. You just need to pour the coffee ground in the still water in and around your home. Once you’ve done this, the mosquito eggs in the water will come up to the surface and they will eventually die due to lack of oxygen. Another easy way to get rid of mosquitoes is lighting up camphor in your room. Make sure the windows and doors are perfectly closed before you light up the camphor. Leave the room closed for at least half an hour. Later, you will see that the mosquitoes that were earlier present in the room are now no more. 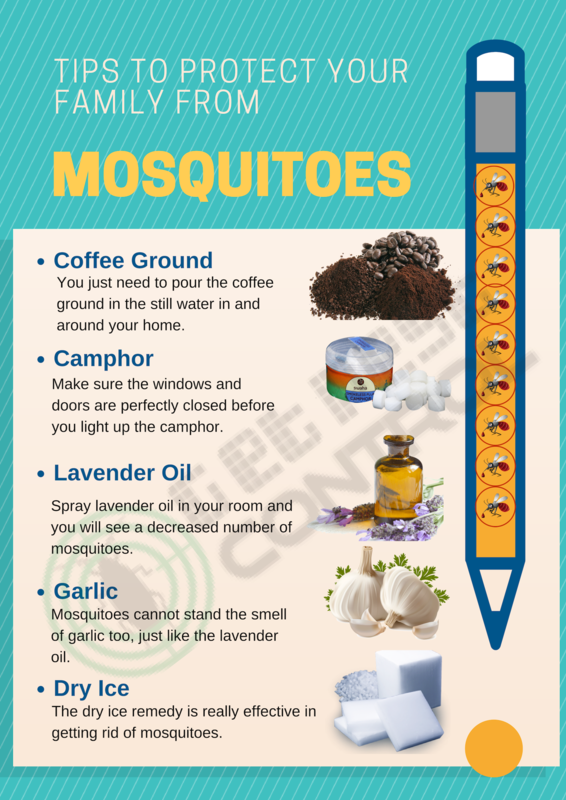 Normally, the mosquitoes cannot stand the strong smell of lavender oil so, all you need is lavender oil to get rid of mosquitoes. Spray lavender oil in your room and you will see a decreased number of mosquitoes. Alternatively, you can apply the oil on your body. Mosquitoes cannot stand the smell of garlic too, just like the lavender oil. They find the smell of garlic unpleasant and this is something that you can turn into a weapon to kill mosquitoes. What you are supposed to do is to take few cloves of garlic and water. Boil the garlic in the water and then spray the mixture in your room. You will see hardly any mosquitoes flying around you. It may be a time-consuming process but, you will get the guaranteed results. The dry ice remedy is really effective in getting rid of mosquitoes. Place the dry ice inside a container and you will notice the mosquitoes getting attracted to it. It is because of the emission of the carbon dioxide gas. You will then notice all the mosquitoes presented in the home getting into the container. You can then close the lid and let the trapped mosquitoes die inside the container. Hope all these natural remedies will help you to get rid of these wild critters. You can now protect your family from mosquitoes in this spring season. Stay healthy!